We did have unexpected 'summer showers', quite comforting past week but the sun is back with all its vigour from today.. The Cocktail Lady hosting the 'Mixed Drinks' theme for MBP wants to blog the same, adapted from a fellow bloggers recipe:).....Sig, by hosting this particular event, you played wise here with lazy bugs like me who would preferably dig out something from the drafts to contribute to any event ;)..
Well, I did have Ashaji’s Masala Chai on my mind for quite some time and discussed this with my sis and alas!.. she sent me pics mentioning she was all set to blog the same Chai as her second entry!..Now, all I was left with, were a few over-ripe mangoes in my fridge which made her point out a wonderful link the very next moment…. 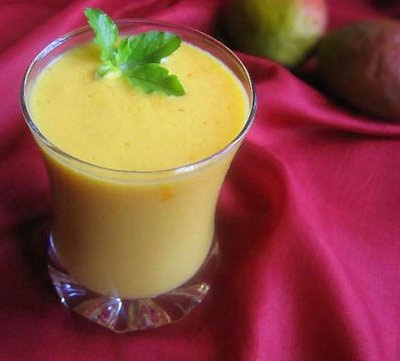 Thus, this Smoothie is adapted from Sailu’s recipe-Aam ki Lassi. 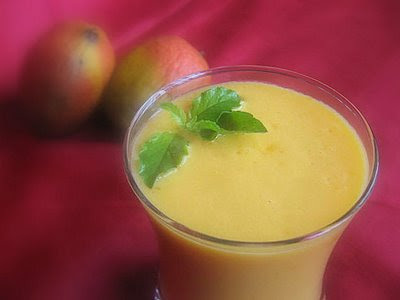 Surprisingly the mangoes with me seemed to be the same ‘Suvarnarekha’ variety she’d used for hers!.. 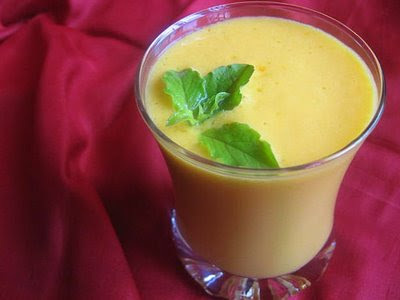 Again, her combination of the drink proved to be just perfect and I followed blindly that yielded a soothing creamy drink for my children, esp for my daughter who helped me with the topmost picture here, and myself soon after the photography sessions :). Summer is just round the corner for us, residing in India. At the comfort of the home, the soothing 'tender coconut water' gets consumed leaving behind the tender white flesh unconsumed. I mostly use them up for making these light and healthy Karikku Dosas for breakfast which take up comparatively amount of oil while cooking. 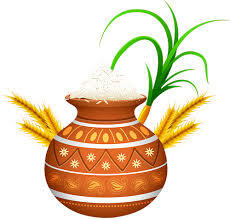 Srivalli, this is specially posted for your Dosa Mela :) .Hearty Congrats on your 1 Lakh mark!!. 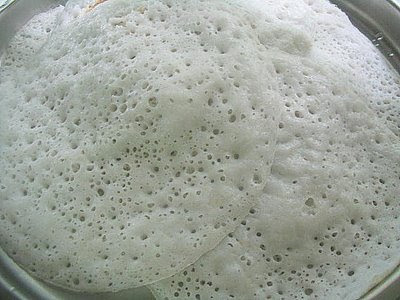 Wash and soak raw rice for a couple of hours.Drain and grind the rice in a mixie along with the tender coconut meat which you scraped and with required amount of tender coconut water to a batter (just as you prepare regular Dosa/Idly batter). The next day morning add cooking soda, sugar and salt to the fermented batter. 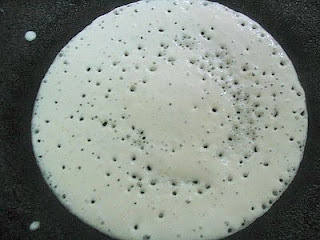 Add more water if necessary so as to make Dosas.Keep aside for 2 hours. 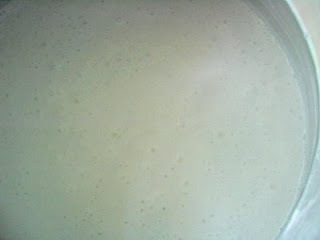 Heat griddle, grease all over and pour round the batter on it, not too thin. Close it with a lid.Let the flame be steady and medium. 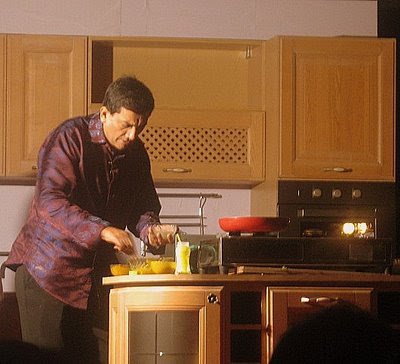 Wait for a few seconds.Open the lid and ensure the top is cooked and soft.Do not turn over.Remove the dosa from the griddle.Repeat the steps for the following dosas. 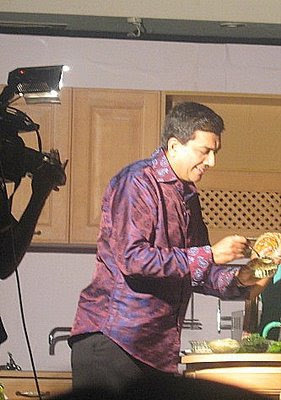 Serve hot with chutney of your choice. 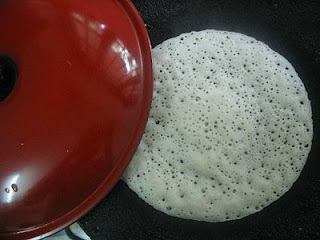 Note: The process of fermentation works perfect with Indian climatic conditions ( just as for the batters of regular Idly/ Dosa) which require natural fermentation.Please proceed the same way to ferment the batter for Karikku Dosas as well, if you reside outside India, provided the temp conditions are different from that of India. Recipe Courtesy-Mrs Beena Kannan, MD, Seematti Textiles, one of my relatives :). 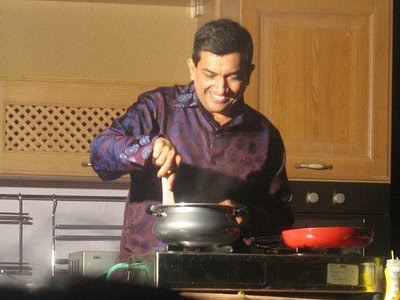 Grind the Coconut, red chillies, shallots, ginger and tamarind together with enough water to make the chutney. 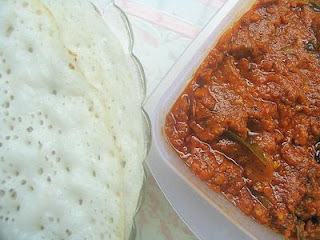 To season, heat oil in a small pan, splutter mustard seeds, fry till brown the shallot bits, add the hing and throw in the curry leaves.Pour this over the ground chutney and combine.Check salt and bring the the desired consistency by adding water if needed.Serve this with any Dosa or Idly. 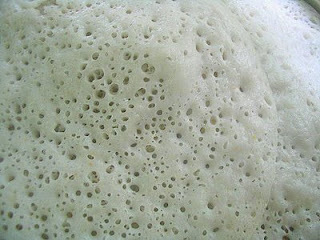 While this dosa itself contains 'coconut' as one of its main ingredients, mostly a dip or a chutney that accompanies should be devoid of the same coconut. Anyway for a lady grown up in a land of coconut trees it's hard to resist coconuts here in the dip as well.This is a basic recipe of chammanthi in Kerala Cuisine. But I would strongly suggest you to carry on with a dip of your choice. 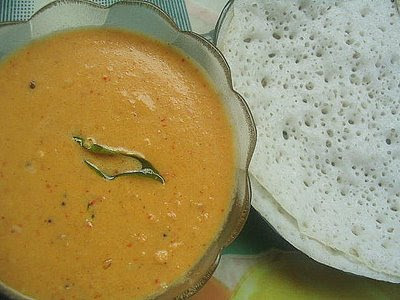 This Fiery-red 'chilly-tomato-garlic' dip went very well with the Karikku Dosa. As you see, this was shot in a careless way, casually while trying the irresistible combo and pls accept my apologies for not typing down the recipe, in this post ;) .. In T.N baby potatoes are available almost year round while I still wonder to have never stumbled upon these cuties in my native place. 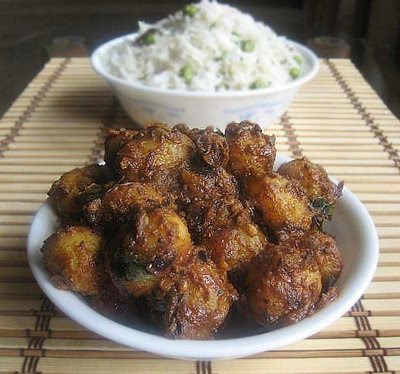 The magic of these spiced up potaoes is that, this goes well with almost all main dishes; be them Chappathis, Plain rice with Sambhar, Dhal, Theiyal or any kuzhambu or even with plain Curd rice.. 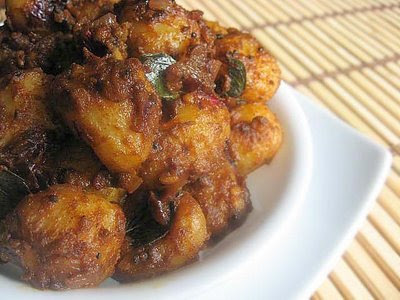 The “hit-dish” in my family is named as Kutty Urulai Kara Curry , somewhere between a dry and a semi dry one. Today I served this as an added dry side dish for peas pulao and cauliflower gravy. Sia, here’s my Ode to Potato. 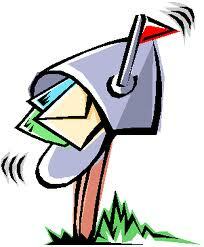 It's already raining pototoes in the blogosphere for you and this is just a droplet!!!.. 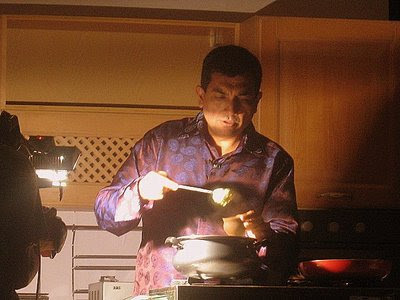 ... now, back to the recipe..
1. Wash the potatoes.Pressure cook till 2-3 whistles.Peel when cooled down and transfer to a broad bowl.Let the potatoes be rightly cooked not too hard, not too soft. 2. Add the powders(sambhar, turmeric and salt) sprinkle water.Mix well to get the powders coated to the potatoes.Marinate for at least half an hour. 3. 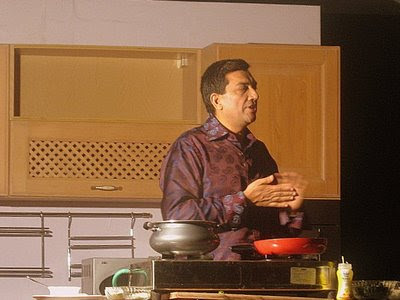 Heat oil in a wide non-stick Kadai.Splutter mustards,brown the urad dal,fry the onions and garlic till transparent. 4. 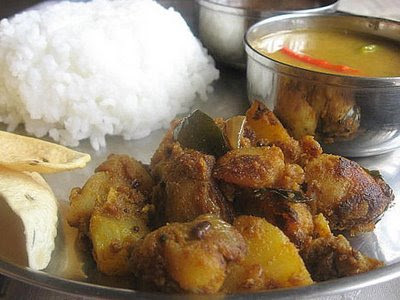 Throw in the curry leaves and add the marinated potatoes.Mix well.Keep the flame to medium.Spinkle more water if necessary.When the curry gets really hot, lower the flame. 5. Cook open without a lid.When the water gets absorbed mix well.Check salt and let it get toasted for about 15-20 minutes. 6. Remove from fire when the spices are all coated well the potatoes acquire a deep brown colour with that toasted spicy finish. Serve hot. 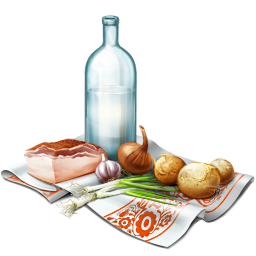 The same dish with diced 'regular' potatoes and less onions. Served with steamed white rice, sambhar and rasam..
1. Regular potatoes can also be used to make this dish. Pressure cook them with skin sliced to big chunks, peel off the skin once cooked and cooled and dice them to bite sized pieces and follow the above methods of preparation. 2. Instead of Sambhar powder you can use a mixture of ¾ tsp coriander powder + ¼ tsp jeera powder + 1/2 tsp chilly power. But sambhar powder gives the best balanced taste. 3. Play along with powders like curry masala, garam masala or a combo to get a varied taste preferably for Chapathis, Rotis, Pulao etc.